A well-built hybrid with a great screen - but is it for you? 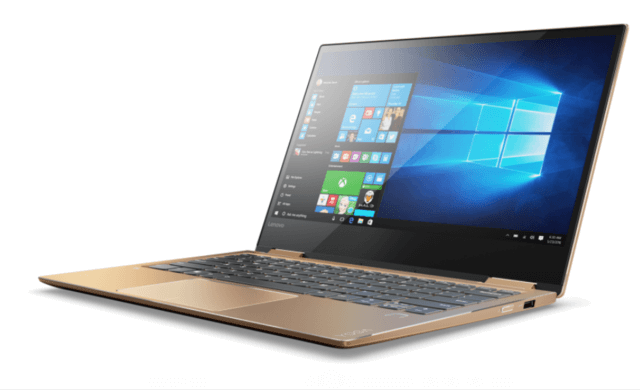 The Lenovo YOGA 520 14IKB 80X8 is a quality, slick, flexible 2-in-1 hybrid laptop with great specs all round – and it’s in our top two budget laptops under £700. With a stellar processing power and impressive screen, this is a fantastic laptop for small business owners and probably the best value 2-in-1 laptop around. Lenovo invented convertible laptops and is still making some of the most reliable 2-in-1s on the market today. The Lenovo YOGA 520 performs well in all areas and it’s rare to find a well-crafted 14-inch laptop for such a fantastic price. At 14 inches, the Lenovo Yoga 520 is big enough for comfortable work all day, but lightweight and portable enough to fit around your preferred working habits. If you’re a busy professional, you need a fast processor and the Intel Core i3 is just that. You’ll be breezing through Word, Excel and the web at ease (just don’t expect this 2-in-1 to double as a gaming laptop too). Hybrid laptops are designed to offer that bit more flexibility and the Lenovo Yoga is known for being ultra user friendly. The touchscreen is easy to use and the fingerprint login won’t let you down either – plus it adds a layer of security that’s so important for business owners these days. The battery life is fine and pretty generous for such a budget laptop – around seven hours will see most small business owners through their bouts of time between charges, whether that’s working from your sofa or during flights. And you can count on Lenovo to pack a quality battery into this device. This is great HD screen – with clear text and bold colours. There is also a nifty covering that protects you from screen reflections, so you can even take your work outside. The touchscreen is also responsive and the tablet mode works really well. You won’t find many 2-in-1 laptops with audio worth celebrating and at this price point, it’s basically unheard of. That said, the sound on this Lenovo Yoga is completely fine for business use and you can always plug in your headphone or hi-fi system if you need that bit more oomph. The Lenovo YOGA 520 was made for the small business owner on a budget. It’s got an easy-on-the-eye 14-inch screen with a powerful Core i3 processor and the 2-in-1 flexibility is ideal for creative professionals. Anyone who likes to work on the go will enjoy how lightweight and portable this little machine is. In tablet mode, it’s really a joy to use and the touchscreen works well. For under £700, it’s hard to get too excited over the sound quality of any convertible laptops, but for everything that matters to everyday business tasks this is a fantastic option. Quite simply, this is an excellent all-rounder that’s well-rated by users and the best value convertible laptop we could find.